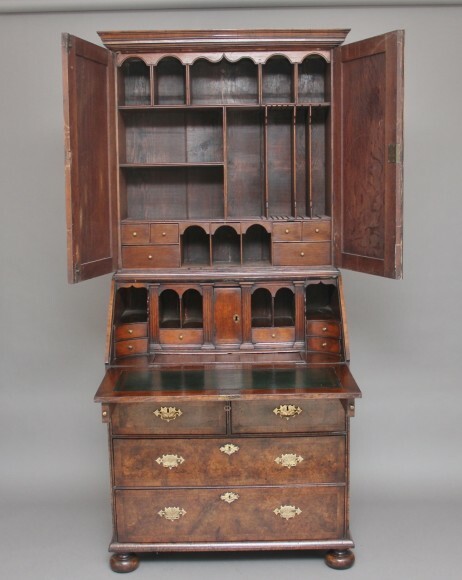 A lovely quality burr walnut bureau bookcase having an 18th Century carcass and re-venered in the early 20th Century, the moulded cornice above two doors with fielded arched panels opening to reveal various oak lined compartments and drawers, the bureau having a crossbanded fall opening to reveal a green leather writing surface, oak lined drawers, various compartments, a cupboard at the centre and a slide that opens to reveal a well. The bureau having two short over two long oak lined graduated drawers, with brass plate handles and escutcheons, standing on turned bun feet. Circa 1920.